Our simple process allows you to easily personalize every aspect of the custom tank, even the label. Simply upload your own images and designs. A dream process for designers, fashion students and anyone wanting to be creative. Fully customizable for a true bespoke design, print on the front, back, side, neck, rib and even your own label. This tank is perfect for poolside or hitting the gym. I absolutely loved the product ! Thank you. Communication was great! Very good quality and was delivered very fast. Perfect to wear on vacation! Very please with how the design came out on the fabric. I had slight difficulty figuring out how to get my design on the panels. Customer service was helpful. Sleek and floaty with a subtle shine. This is a loose fabric. All- weather breathable fabric, come rain or shine, that will keep you comfortable. Resistant to shrinking, over-stretching and creasing. Care: Machine was 86 degrees F. Quick dry or medium tumble. Iron and steam safe. Do not wring. Bounce cotton jersey is moisture wicking, drawing your sweat away from your skin. Good stretch with a matte finish. Some shrinkage will occur on the first wash (Please keep in mind when choosing size). As our Cotton Jersey is made of a natural cotton it has a slightly off-white base tone, giving slightly muted colors in comparison to the other jerseys. This gives your t-shirt a completely different, authentic look. Care: This fancy fabric needs a little more TLC. Wash inside out at 86 degrees F and hand dry. Iron safe. Dry cleaning safe. Do not tumble dry, steam, soak, or wring out. Pique knit gives this fabric unique holes and airflow characteristics. It has a slight sheen and mesh-like quality, making it super breathable. With a soft feel, and a relaxed medium fit, this top is perfect for going out, working out, or living in the summer sun. High quality is our promise, and an all over color print is the way we do it. Care: Wash at 86 degrees F. We suggest that you turn the tank inside out when washing to avoid damage. If seen as necessary, you can tumble dry on low. As the material dries quite fast, however, drying it flat or on a line to drip would be a perfectly suitable option. Your design is printed onto the fabric by our expert technicians using the most up-to-date printing techniques. Once printed, skilled craftsmen will cut each individual panel for you personalized cut and sew vests. Printing first ensures that the design runs from edge to edge. You can design the front, back, neck rib and custom label, so if you’re part of a sports team, this is the ideal way to get your kit looking fresh. Add a contrasting color to the neck rib for a cool effect. Print your club’s emblem on the front, and each player’s name and number on the back for a unique kit design. With the customization features, you can create standout vests that good on and off the court. Create your own personalized vests for your holiday and really make an impression. Express your style poolside, beachfront or out on the town with a unique design. For a bachelor party, get the squad together and print your nicknames or create a photo collage vest featuring all your awesome nights out. 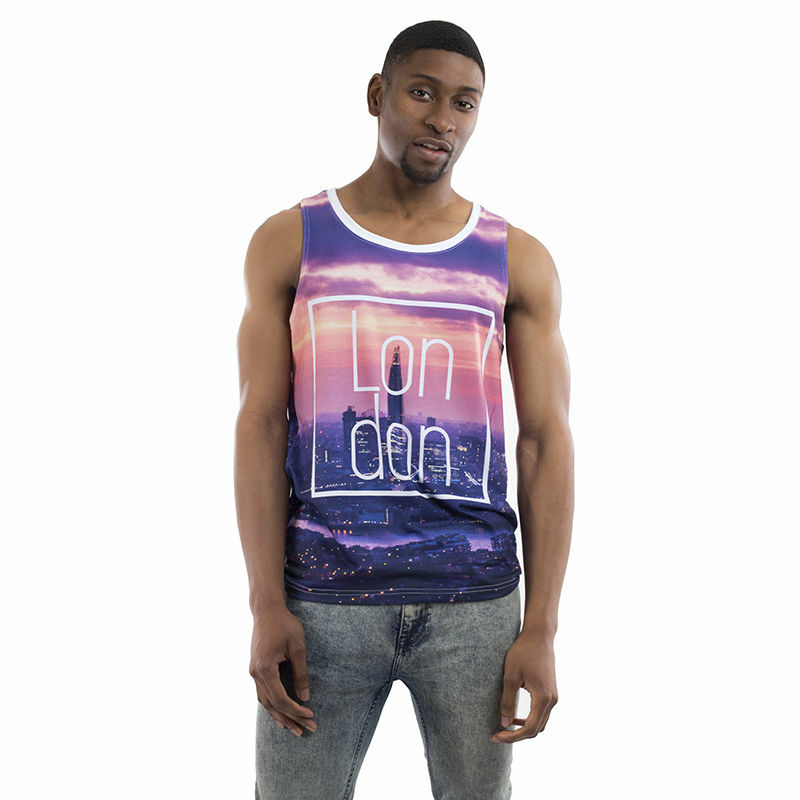 Or, order just one or two vests for a personal outgoing thanks to our no minimum order amount. The breathable properties make these vests ideal for the gym, but don’t just rely on your music playlist to motivate you. Find your favorite exercise quotes and emblazon them all over your custom vest. You might even inspire your fellow gym goers. Please note that the cotton bounce jersey is 100% natural, so it has an off-white base tone and produces a slightly muted print. Because of this, we suggest choosing designs with a busy pattern and lots of detail, instead of large blocks of solid color.